I have recently made it known to the park urchins that I will pay a nickel to anyone who makes me aware of unusual occurrences within the Park. Tonight, this offer once again paid off in the form of a magnificent sight. A young girl, probably not much older than ten years, was found loitering on the step of my boarding house by Mrs. Dowd. With much cajoling on Mrs. Dowd’s part, she was able to encourage the girl to express herself in a terrible stutter. She eventually expressed that she wished to collect a nickel for showing me something. Mrs. Dowd summoned me from my laboratory with this news, and I met with the child. I made it plain and certain that I would only pay the nickel upon being presented with whatever oddity she had discovered. This was acceptable to her, so I gathered my equipment and we set off, despite the approaching nightfall. “B-b-beautiful,” was all the girl would say, shaking her head and twisting the hem of her dress, which was not much more than rags. She led me on merry walk through a section of the Park much more domesticated than I had been spending my time in recently. It wasn’t long before I spotted our destination. Just below a hill, within a copse of trees, I saw a singular tree glowing brightly as if lit from within by electricty! By this point, the sun had set completely. A glowing tree alone would be quite marvelous indeed, but this was only the beginning of the show. Very shortly, miniscule lights began to flutter in from several directions, but predominantly the north. 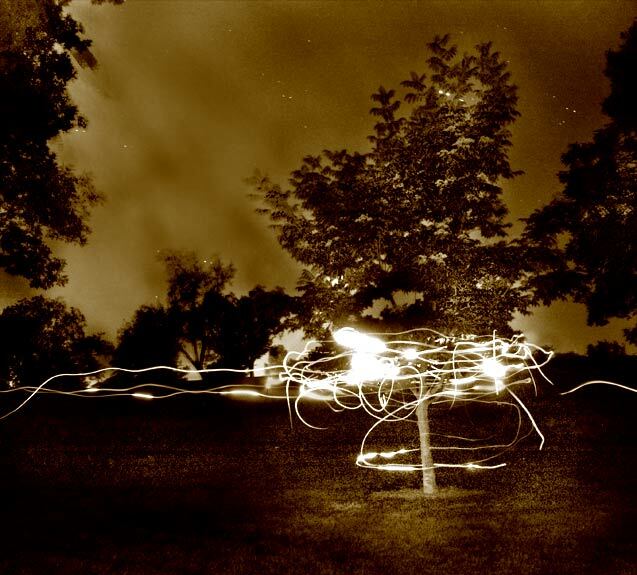 These lights began to dance merrily in the air, forming a ring about the tree. They wove wild and amusing patterns in the air. I was able to make one photonic capture at the beginning, despite the poor quality of light that so often plagues work in the evening. I paid the urchin and sent her on her way before approaching. The lights reminded me very much of fireflies, a common insect in other lands, but insects of the ordinary sort are rare in the Park. I soon discovered that they were in fact a kind of luminous faery of a species I had not yet seen. They were of the typical humanoid frame, but with a light-emitting and transparent skin. Some sort of white substance just beneath the surface was the source of the bright light, as best I could tell–I had to don my tinted goggles just to make out these details. Adding to the difficulty of my examination was their refusal to remain motionless for very long. You can only imagine the sight of this fool chasing the little creatures around and round their tree. The tree itself was a common species, not unusual in any way except that the fire faeries had deemed it some kind of mating place. Looking at the surface of the tree, I discovered numerous copulating pairs, and many unpaired females. The females gave off a slightly different hue of light. So it appeared that the females had gathered together instinctually in a single location to collaborate on drawing in the males, which seemed to be attracted over quite a distance. Most of the park is without lighting in the evening, but I have read in the papers recently that some would like to see electrified lamps placed about the park’s edges. If such plans move forward, I fear there will be many a confused fire faery male. I will have to write a letter to the editors in the morning advising against any artifical lights within the park.